Jennifer McChristian came from Montreal, Canada, where she was born and began her study of art, moved to California, and received her BFA from Otis Art Institute (now Otis College of Art and Design) in Los Angeles. McChristian devotes herself largely to plein air painting. 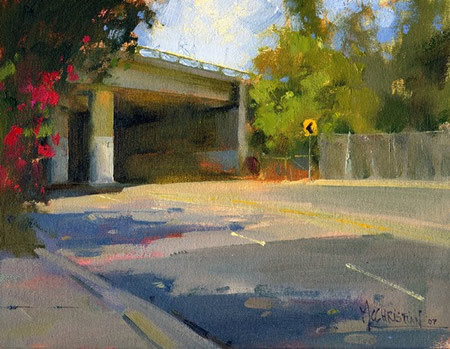 Though some of her paintings are of the fields and trees that are routinely subjects for plein air painters, she more often finds interest in urban scenes, streets, roadways and, interestingly, highway overpasses. She applies her paint in brusque, unblended strokes of color, giving her work a feeling of immediacy and directness. The rough edged patches of paint form a textural component and are at times combined with scumbled areas. She uses a bright, slightly “pushed” palette, that imparts a lively energy to subjects like boarded up gas stations, construction sites and highway underpasses, that might otherwise seem like dull subjects for paintings. She also revels in the geometry of these subjects, working their bulky forms and cast shadows into interesting compositions. Her online gallery features landscapes, figures and works on paper. Clicking on an image produces a pop-up window with a larger image, and a convenient forward and back navigation within it, allowing you to move through the large images without returning to the smaller versions. Unfortunately, this is hampered by a script that annoyingly resizes the window for each image, a case of the designer defining and defending a design space at the expense of user experience. You’ll find slightly older works in the Archive section, showing a continued interest in the forms of bridges, culverts and overpasses. Addendum: Thanks to Jason Waskey for reminding me that I neglected to mention Jennifer McChristian’s blog, on which she posts larger images of her paintings (click on the ones in the blog posts for enlargements), as well as discussing some of her experiences while painting them on location. When I first wrote about Simon Rodgers about a year ago, I pointed out that I knew almost noting about him, except that he is a concept artist working in the film industry, who likes to work and sketch digitally. His eerie and dramatic landscapes, imaginative environments, mysterious caverns and enigmatic structures are rendered with digital aplomb and a flair for dramatic lighting and dynamic composition. His oblong compositions, which have a distinctly widescreen cinematic feel to them, are often almost monochromatic, taking some of their power from intense highlights of complementary colors. He seems to have a special knack for dramatic rock formations, elaborate caverns and wildly improbably stone bridges and pathways. Simon was kind enough to write recently and let me know about the Colors! application for Nintendo DS, which he found out about from Sparth’s blog; sparking one of the more popular topics in recent lines and colors posts. It occurred to me in the process that I hadn’t checked in on Rodgers’ site or blog, which are under his industry nickname, “Sim-r”, in a while. I was delighted to find that, in addition to his new quick thumbnails and sketches, some of which are done on the DS in Colors!, he has added to the galleries of his more finished digital concept paintings, illustrations and landscape paintings, as well as including a gallery of pages from an as yet unfinished graphic novel project. I was unsurprised to find that I still know next to nothing about Sim-r. He seems to have intentionally left out of both his blog and his gallery site any mention of career, background, clients or projects, apparently preferring to let the art speak for itself. I’ll follow suit and let you just click over and enjoy. Jeffery Smith is a California illustrator who employs a palette of rich colors and deep chiaroscuro in the service of compositions that illustrate a broad range of subjects, from portraits, sports, romance and travel, to crime, mystery, conflict and war. Smith seems to be able to break down the objects, figures and settings in his images into areas of color that feel like isolated shapes, while simultaneously serving as part of the representational image. Combined with his strong value contrasts and a peppering of texture, the result is at once graphic and modeled, conveying a strong sense of mood. His compositions often read as dark punctuated with light, rather than the other way around, even in daylight scenes. Smith’s extensive client list includes publications like The New York Times, Rolling Stone, New York Magazine, Esquire, Atlantic Monthly, Forbes, Time and Sports Illustrated, as well a numerous book publishers. He has received awards from Communication Arts, the New York Society of Illustrators, Print, the A.I.G.A., the Society of Newspaper Design and the Society of Publication Designers. His work regularly appears in major illustration annuals and he has been profiled in Communication Arts and How magazine. Smith is now a full time professor at the Art Center College of Design, but still continues to take on freelance illustration assignments. His web site is hampered by a somewhat awkward navigation system that requires you to use a series of back buttons, rather than offering simple navigation choices from all pages. Once in the galleries, however, and into a particular topic, you can at least navigate through the images in a given section with convenient forward and back buttons. The galleries include a number of topics, including a section of figure drawings, which are nicely modeled with hatching, and sketchbook selections, as well as his designs for posters. Since I first was introduced to computer graphics back in 1994, I’ve wanted a digital sketchbook. My wife still kids me because that year, after I was introduced to digital art by working with Photoshop on a friend’s Mac, I took a Photoshop book to the beach with us and read it like a novel, before I had either Photoshop or a computer to run it on. I also found myself right away imagining a Mac tablet computer, on which I could paint with digital colors on the beach, without the hassle and complications of carrying around the materials for plein air painting. I’ve been waiting not-so-patiently for Apple to release one for the last 13 years, and, though rumors are flying again about an iPod Touch style tablet, I’m still waiting. In the meanwhile, I haven’t been willing to drop $1,200 plus on a Windows tablet computer that I would have to buy additional software for and that I would use for only one purpose, so I’m left with few options. I do some digital sketching with my Powerbook and a small Wacom tablet, but the combination isn’t as compact and portable as a tablet. I’ve been running TealPaint, a fairly clever little digital painting application on my Clié (Palm PDA), but it’s frustrating in that there is no allowance for “soft” brushes that simulate painting with lowered opacity strokes; everything is hard edged, and blending can only be simulated with patterns. 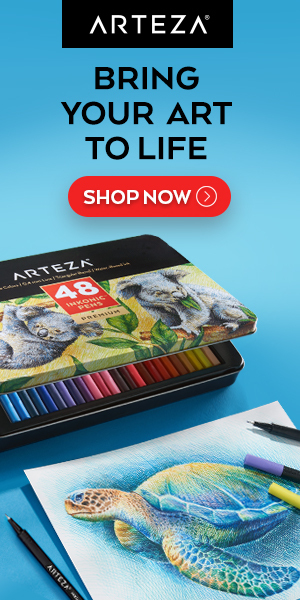 Simon Rodgers, a concept artist who I profiled in 2006, and who enjoys painting digitally, was kind enough to write and let me know about what amounts to a pocket sized digital sketchbook for under $200. It’s a solution that allows digital painting with soft and hard brushes and varied opacity. Oddly enough, it’s by way of a portable game device. Jens Andersson has written an application called Colors! that runs on the Nintendo DS portable gaming device (Amazon link). The Nintendo’s pressure-sensitive screen and stylus, combined with its small size and relatively low price, make it an excellent candidate for a digital sketchbook. Though I haven’t had a chance to try this yet (I may wait till after Christmas to see if I can pick up a DS cheap, and just to make sure they don’t announce an Apple tablet at Macworld), but by all accounts Jens has done a nice job. The consensus seems to be “It may not be Corel Painter, but it’s pretty darn good”. The app lets you use the aforementioned hard and soft variable opacity brushes, that by all appearances look like they do a pretty good job for digital painting, a color picker, eyedropper and other simple tools. Jens is still developing the app, but points out that his intention for it is to remain simple. The site for the Colors! features an online gallery that includes some impressive work. There is also a YouTube vid in which a user gives a short tour of the app. 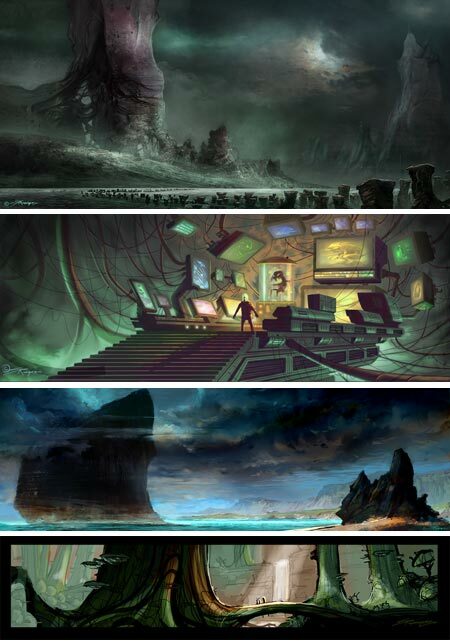 For more impressive images that show off the applications possibilities, see some of Simon Rodgers’ quick concept sketches, and some en plein air digital sketches by Sparth (Nicholas Bouvier) a concept artist who has long been an advocate of on location digital painting with a laptop (see my profile of sparth construct from 2006). 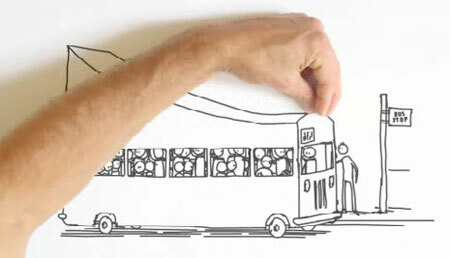 You’ll also find his concept sketches in the Colors! gallery. There is also a similar application for digital painting on the Nintendo DS under development by Bob Sabiston, who created the Rotoshop software used in the rotoscoped movies Waking Life and A Scanner Darkly, under the working name of Inchworm. You can see some of Bob’s Inchworm images here, and a Popular Science article with a video tour of the app. Inchworm has not been released. It may become an official Nintendo product, or it may be released to the homebrew circuit, but Colors! is available now and looks as good or better. Unfortunately, creating a digital sketchbook with Colors! it isn’t quite as simple as buying a DS handheld game system (about $130) and downloading the software (free). You also need a “homebrew enabled cartridge” (about $50), which is a hardware adapter that allows you to put the application on a compact flash card that can then be read by the Nintendo’s top slot. I don’t know the ins and outs of this, as I haven’t purchased one, so I’m reluctant to recommend a cartridge or a supplier (it’s a specialty gaming item). There is a FAQ on the Colors! site, but it’s not aimed at newbies and non-gamers. Also a couple of things I didn’t mention in the original post: the images are saved as PNG files at the root level of the memory card in a folder called colors/, and can be easily transferred to your computer and opened in Photoshop/Painter/whatever. The resolution is 512×384. Another interesting feature of Colors! is that the sequence of creating a drawing or painting can be recorded, and then played back like an animated movie (similar, perhaps, to the feature in Corel Painter). These recordings can be shared between Colors! users, and frequently are through the online gallery. There is a Java applet running on the Colors! Gallery that lets you play back the recording of the brushstrokes in your web browser, giving you a time-lapse animation of the making of the painting. If you click on the thumbnail images to go to the large versions, you will see a Playback button below many (but not all) of the images. Addendum II: Chantal Fournier has written with a link to a very good step by step tutorial by Jannis Borgers on how to set up Colors! on the Nintendo DS in the ConceptArt.org forums. The detailed how-to includes photographs of the DS, example adapter cartridges like the M3 DS Simplify and the R4 Revolution, and the tiny microSD memory card. The article thread also includes three pages (at present) of lively discussion about using Colors! on the DS. Raphael Piasek, who created and maintains the Colors! gallery, has written to let us know about a more advanced feature. The current version of Colors! allows you to email your images to yourself (or someone else) using Wi-fi. In the process, will reinterpret the native format DRW file (not the 512×384 PNG) into a 1024×768 JPEG. As an example he points to this image. There is also a Java applet by Ben Jaques called ColorsDraw that is used on the Colors! gallery to display the recorded painting sequences, the desktop version of which will run on any computer with Java installed and can interpret the images up to 2084×1536. How this works is still a bit of a mystery to me, but so is the nature of the native DRW file format, which apparently stores a record of the brushstrokes. Piasek has written to say that the application apparently records the brush strokes as vector information, and they can be played back at a larger size with larger brushes to create a new, enlarged version of the image. Piasek mentions that the Colors! FAQ has been updated to include information about the ColorsDraw applet. There is also some discussion of this on the ConceptArt.org post mentioned above. Ever since I first saw Chuck Jones’ wonderfully imaginative and brain-tinglingly loopy Warner Brother’s cartoon Duck Amuck as a kid, I’ve had a weakness for cartoons that break the fourth wall (i.e. the invisible barrier between audience and characters in the entertainment), particularly in the oblique way of having an animated protagonist encounter the animator who is drawing the cartoon in which the character exists. There’s just something surreal and magical that I find particularly appealing about the whole idea, perhaps the result of my inordinate fondness for Crockett Johnson’s Harold and the Purple Crayon as a child. (As a side note, I understand the Harold and the Purple Crayon books have been made into an animated series for HBO, a situation that only makes me a bit sad, and instills me with no desire whatsoever to see the shows). I posted in June about a Flash animation by Alan Becker that evokes the same animator/character relationship, and here is another short (one minute) animation that follows that pattern, in this case an ad for V Water. This one is a bit different, though, in that our animated protagonist is enabled, rather than hindered, by the hands of the animator. Unfortunately I haven’t found creator credits for this one. Staring into the dark, bejeweled recesses of Gustave Moreau’s hallucinatory interpretations of a classical mythology that apparently came from some alternate dimension, it’s difficult to grasp the idea that, as respected professor at the École des Beaux-Arts in Paris, he was an influential teacher of Henri Matisse, Georges Rouault and Pierre Bonnard, and hung out with Edgar Degas. Of course, the Symbolists and Surrealists loved Moreau for the very same reasons. Andre Breton, the leader of the Surrealist movement, declared that encountering Moreau’s work at the age of 16 “influenced forever my idea of love”, (a bizarre notion which may account for something in Breton’s makeup). There is a museum in Paris, Musée Gustav-Moreau, in the mansion that was his home and studio. The museum’s online presence has a nice selection of his drawings, which are otherwise underrepresented on the web. There are books on Moreau, from the expensive to the inexpensive, and you can find him mentioned in context in Michael Gibson’s nice overview of the genre, Symbolism. Moreau is considered a Symbolist, which is a pretty loose definition, as it wasn’t as much of a concerted art movement as the literary one, but I don’t think he was ever officially allied with a group. He was an influence on contemporaries like the Pre-Raphaelite Byrne-Jones and others. He was also influential on writers. 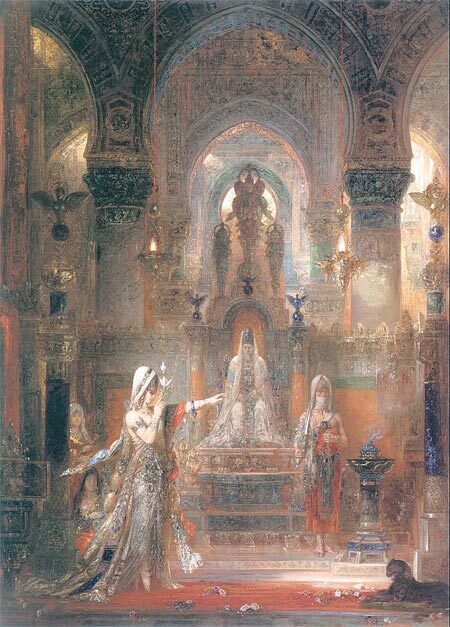 His two paintings of Salomé, The Apparation and Salome Dancing Before Herod (image above) reputedly inspired Oscar Wilde to write his notorious play Salomé in French. Contemporary comics writer Alan Moore, in the second volume of his wonderful, literary reference packed The League of Extraordinary Gentlemen (not to be confused with the execrable movie nominally adapted from the series) played with the notion that Moreau was the nephew of H.G. Wells’ Doctor Moreau, and had based the form of his more disturbingly chimeric entities on the unfortunate victims of the doctor’s appalling experiments. Critics, of course, find Moreau’s own experiments equally appalling, and they’re probably right about his weaknesses and excesses; but those of us who are wise enough not to let critics’ finely-honed narrowness of mind interfere with our enjoyment of things can find delight in Moueau’s striking monuments to l’esprit décadent.